North of Dayton, Ohio, in the small town of New Carlisle, there’s a stretch of U.S. 40 called Wayne Embry Way. It runs in front of Tecumseh High School, where the 6-foot-8 future Hall of Famer spent his teen years as the only black player on the team — and the only black student at the school. Known as “The Wall” because of his stature and his ability to block shots and set screens at the center position, Embry also reached the highest executive level in the sport, becoming the first black general manager in the NBA. “It’s indeed a great honor to be honored on this occasion because I have a great respect and admiration to Dr. King and what he meant for this country and for all Americans,” Embry told The Undefeated. Embry attended Miami University, near his hometown, and earned a bachelor’s degree in education. He was selected by the St. Louis Hawks in the 1958 draft and was traded to the Cincinnati Royals shortly thereafter. Over his 11-year NBA career he was a five-time All Star with the Royals and won a championship in 1968 with the Boston Celtics. He was taken by the Milwaukee Bucks in the 1968 expansion draft, and just a year later he was in their front office as an assistant to the team president. He helped create a Bucks team that included Oscar Robertson, Bob Boozer, Bob Dandridge and Kareem Abdul-Jabbar. The Bucks won their only NBA title in 1971, sweeping the Baltimore Bullets in four games. In 1972, Embry was named general manager. “I was stunned,” Embry said. “I had no idea because back in those days I never gave it a thought that anyone would even think about considering me as a general manager — it never happened before. I just vividly recall being in my office in Milwaukee and I got a call from ownership, and they called and said they’d like to meet with me at 4 o’clock that afternoon. Abdul-Jabbar left for Los Angeles in 1975, and Embry’s days in Milwaukee were numbered. Off the court, his community activism includes mentoring youths and young adults. He’s held board positions at the Federal Reserve Bank of Cleveland and several companies, including Kohl’s, Centerior Energy Corporation, PolyOne, M.A. Hanna and Ohio Casualty Insurance Company. Embry is a member of Alpha Phi Alpha fraternity and the author of the autobiography The Inside Game: Race, Power, and Politics in the NBA. 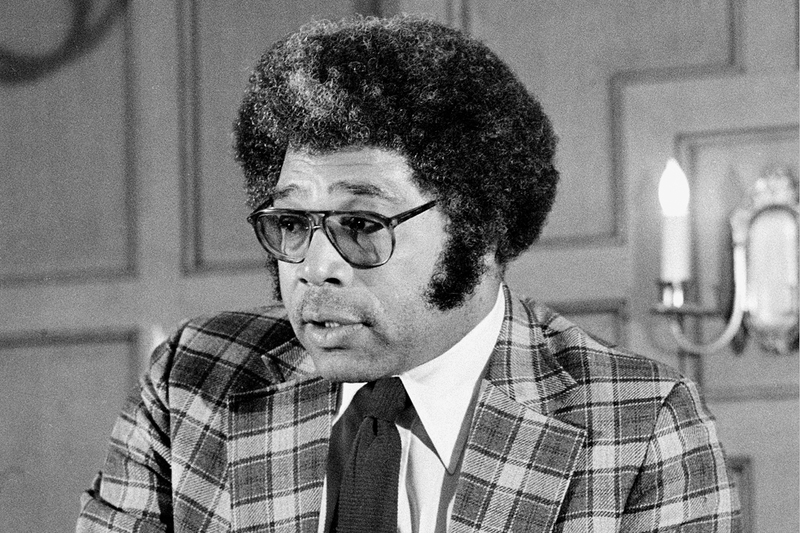 Wayne Embry announces his resignation as general manager of the Milwaukee Bucks during a news conference on Nov. 23, 1976. 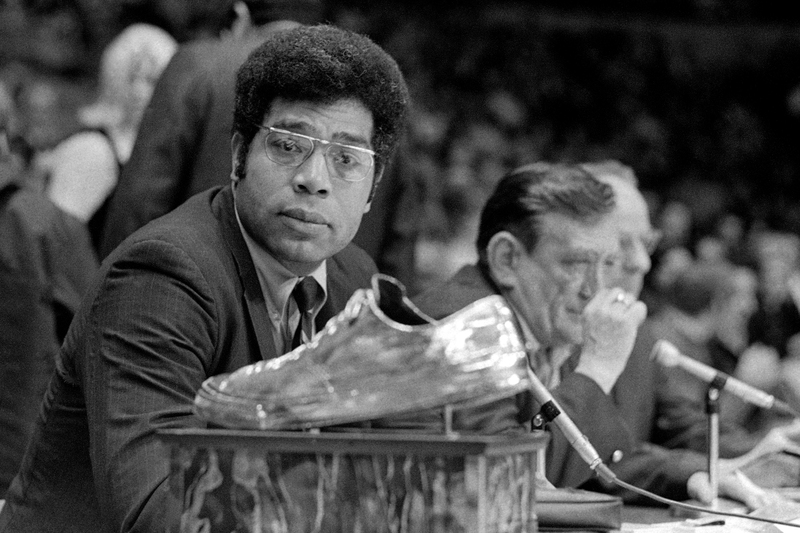 In 1972, Embry became the first black general manager in professional sports. “I think for us athletes we’ve got to just step back and think that we are blessed to have the opportunity to play professional sports,” Embry said. “It’s just important that we give back and encourage others. Since 2004, Embry has been the senior basketball adviser for the Toronto Raptors, and he continues to encourage players. “I try to tell them to keep thinking positively and to realize that they might have to persevere through certain circumstances,” Embry said. After his tenure with the Bucks, he eventually became a general manager for the Cleveland Cavaliers and accomplished another first when he was promoted to president of the team in 1994. In 1992 and 1998, he was honored as NBA Executive of the Year. A trustee of the Naismith Memorial Basketball Hall of Fame since 1974, he was enshrined in 1999.